Melatonin sleep aid indicated for treating insomnia. Sleep aid supplement identical in structure to natural hormones. Melatonin is a natural hormone produced at night by the pineal gland in response to darkness. It helps the brain differentiate between day and night to regulate sleep cycles and the circadian rhythm. Production begins to decline after puberty and continues to decrease regularly until the age of 70 by which time it may have fallen by 90%. This drop in melatonin levels sometimes results in sleep disturbances in older people. It can also mark the start of a number of degenerative diseases. Melatonin in supplement form is a synthetic product that is strictly bio-identical to the hormone produced naturally by the pineal gland. Regulating and controlling our biological clock, melatonin is primarily used to improve sleep. Melatonin also has remarkable antioxidant power: it promotes the body’s production of natural antioxidant enzymes such as superoxide dismutase or glutathione peroxidase. It also releases activity which results in decreased production of inflammatory inducers such as nitric oxide synthase or lipoxygenase. - has been studied for its potential in treating age-related neurological problems such as Alzheimer’s disease. Melatonin supplement, what’s the correct dose? Needs vary significantly from one person to another. 2.5-3mg is generally enough to promote sleep. If waking up the next morning becomes difficult, then this dose may be a little high. If, on the other hand, you do not sleep for long enough, the dose may be increased. The sublingual form is particularly suitable for quickly countering the effects of time differences, while the slow-release form is better for night/early morning wakefulness. Melatonin should always be taken at night. If taken in the daytime, it may cause drowsiness or dozing and a lack of coordination. Unlike sleeping pills, melatonin - taken at the right dose - rapidly promotes natural, restorative sleep which resynchronises the circadian rhythm. It does not lead to addiction or dependency. Sleeping pills, on the other hand, suppress the sleep phase devoted to dreaming (REM), require increasingly high doses and gradually lead to heavy dependency. With melatonin, you will wake up fresh and alert; with sleeping pills, waking up becomes difficult, as if you have a hangover. Melatonin is a supplement that is exceptionally safe and free from side-effects. In a Dutch study involving 5000 women taking 75 mg of melatonin a day for five years, no side effects were reported. The study also showed that at this dose, oestrogen production was inhibited and it may therefore be a substitute for the contraceptive pill. Synthetic melatonin is produced from pharmaceutical grade raw materials in GMP (Good Manufacturing Practice) laboratories. Its molecular structure and physiological activity are identical to those of the melatonin the body produces naturally. Our melatonin is a pharma-grade product with a purity of over 99%. 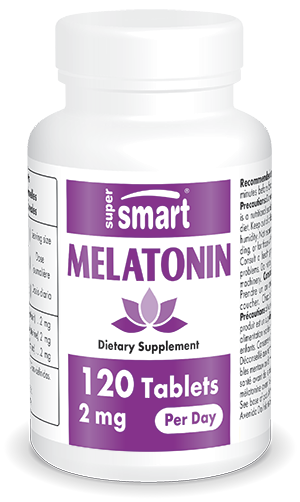 Each tablet contains 1 mg of melatonin.